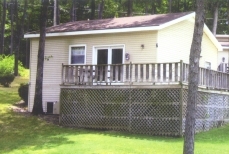 Cottage 7 has two bedrooms, one bath, complete kitchen with dining/living area leading onto a wrap-around deck. Sleeps 4 and can accommodate 6. This cottage has a view of the water, though not directly on it. Central heat and air. NO PETS PLEASE. NO SMOKING. Summer 5 people 6/8 thru 8/17 Sat. - Sat.